Saint Servatius a 4th century Christian bishop, one of the first to preach the Gospel in western Europe. Considered the founder of Christianity in the Netherlands and Belgium. 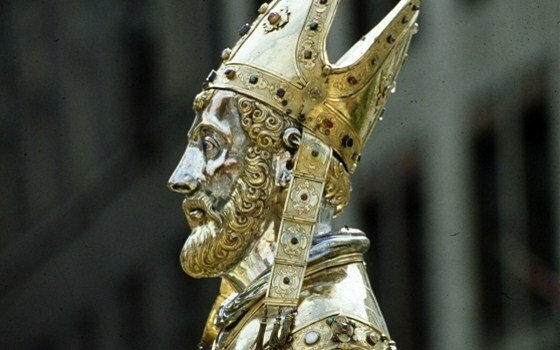 Servatius (Servaas in Dutch) is a patron saint of the city of Maastricht (in Holland), and the towns of Schijndel (in Holland) and Grimbergen (in Belgium). According to legends (two vitae—recently translated into English) Servatius came from Armenia to western Europe preaching Christianity. His Armenian origins were confirmed during the Council of Mainz, when envoys from the Byzantine emperor arrived at Mainz confirming accounts by a certain Alagrecus who had testified that Servatius was Armenian. He has been credited with many miracles, some of which continued to manifest after his death in 384 AD, contributing to popularity of pilgrimages to his remains. The mortal remains of Servaas are kept in a box, which is on display in the Treasury of Saint Servatius Church. The Basilica of St. Servatius (Basiliek van St. Servaas), which is located on the famous Vrijthof Square, is a Romanesque basilica with crypts and treasures. Pilgrims have traveled to Maastricht to visit the tomb of Saint Servatius for centuries. The first stone churches in Maastricht were built after the arrival of Saint Servatius in the fourth century AD. After his death, Maastricht became a popular destination for pilgrims. A small chapel was build on the spot where he was buried. In the centuries that followed, this chapel grew into the St. Servatius Church. I wander if his name was ‘Servats’ in Armenian, which means ‘Beloved one’?